The All Assam Students’ Union (AASU) Advisor Dr Samujjal Kumar Bhattacharya on Monday alleged that all the political parties include the issue of providing Scheduled Tribe (ST) status to the six communities of the State as an agenda only in their election manifestos. Bhattacharya said this while addressing a citizens’ meet in Guwahati on Monday. Moreover, Bhattacharya also appealed to various organisations to come with a unanimous decision on the issue of naming the Bogibeel bridge after Birangana Sati Sadhini. “The AASU is striving to bring all the organisations under one umbrella in the issue,” informed Samujjal Bhattacharya. AACSU leaders demanded that the Bogibeel bridge be named after Birangana Sati Sadhini. Senior journalists Haider Hussain, Adip Phukan, pro-talk ULFA leader Mrinal Hazarika and human rights activist Lachit Bordoloi were also present in the programme. 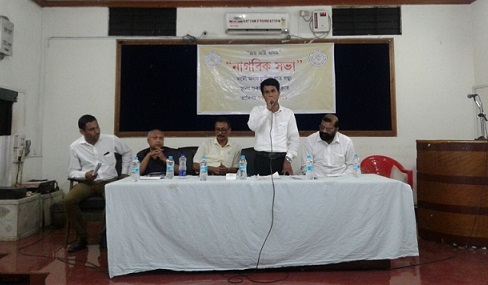 AACSU President Khirod Saikia presided over the programme.